A full selection of my "I Design, You Print" Birth Announcement type listings can be found here. (ie. 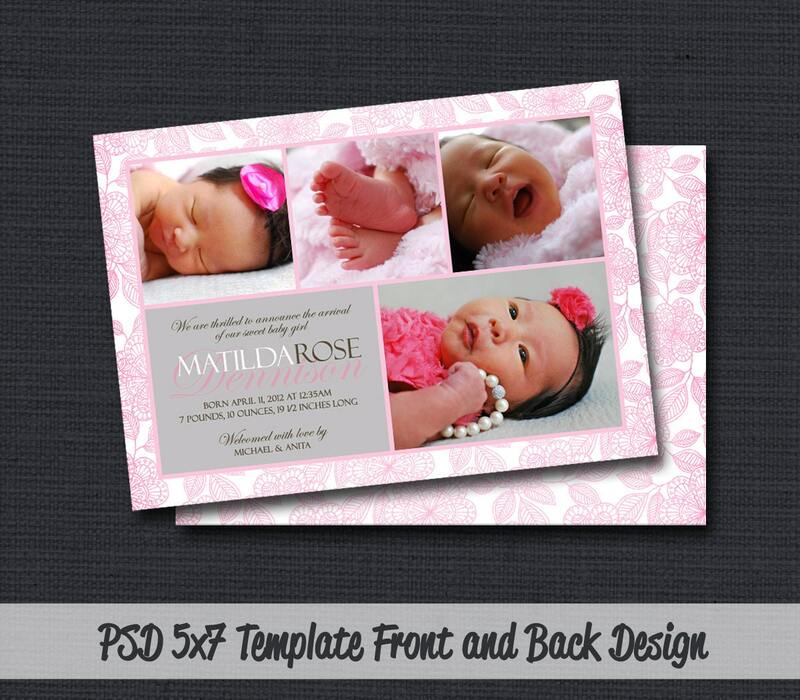 I create your card with photos and text, send you a proof, then printable jpeg file after approval). * Our products are created for professional photographic uses. These designs are copyrighted by Whimsical Creations, you may not resell, redistribute or share these templates in whole or in part for any reason; claim these designs as your own; or sell any design digital or printed on any online store including but not limited to Etsy. By purchasing any file from this shop you accept these terms and conditions. ** Do to the nature of the product, there can be no refunds after the item has been emailed. I absolutely love this thank you card and received many compliments! It was perfect! Thank you! Cheryl is amazing! She responses so quickly and does amazing work! She never gives a problem if you ask her to change something or send it a certain way! I will definitely use her again!! My shop offers both PayPal and Credit Card methods of payment. Due to the digital nature of all items sold in my shop, I am unable to provide refunds. I ask you to approve and double check the proofs that I send before I send you the final high resolution digital file. As any new changes or re-sizing requests after the full sized printable file is received, will incur an additional fee. Please note that sometimes there is a slight color difference between the color settings on your computer of the photo card versus the printed photo cards from your local photo lab. Photos should be 300 dpi or higher for proper print quality. Whimsical Creations cannot be held responsible for photo quality. I cannot be held responsible for lost e-mail. Please be sure to check your spam folders if you have ordered a card and not received a response from me within 24hrs. If the photo you are emailing me was taken by a professional photographer, please ensure that you have full permission in the form of a copyright license from the photographer. You also agree to take full responsibility for any misuse of copyrighted images and agree to not hold me liable for any misuse of copyrighted images.